Schematic of the ITF. Values of the flow and the major passages are indicated by red. Water enters the ITF from the western Pacific and exits into the Indian Ocean. The Indonesian throughflow (ITF) is an ocean current with importance for global climate since it provides a low-latitude pathway for warm, fresh water to move from the Pacific to the Indian Ocean and this serves as the upper branch of the global heat conveyor belt. Higher ocean surface topography in the western Pacific than in the Indian Ocean drives upper thermocline water from the North Pacific through the western route of the Makassar Strait to either directly exit through the Lombok Strait or flow eastward into the Banda Sea. Weaker flow of saltier and denser South Pacific water passes over the Lifamatola Passage into the Banda Sea, where these water masses are mixed due to tidal effects, Ekman pumping, and heat and fresh water flux at the ocean surface. From the Banda Sea the ITF exits Timor, Ombai, and Lombok passages. The location and topography of the channels that make up the ITF are shown in the Figure. Lombok Strait is 300m deep and roughly 35 km wide and the currents vary between 0.286 m/s (0.6 mi/hr) eastward to 0.67 m/s westward and average 0.25 m/s westward. Currents in Ombai vary between 0.12 m/s eastward to 0.16 m/s westward, averaging 0.11 m/s westward and are funneled within the 1250m deep and 35 km wide passage. Timor passage, which is 1890 m deep by 160 km wide, is the widest of the exit pathways and averages only 0.02 m/s. From 2004–2006, 11 moorings were deployed across the entrance and exit regions of the ITF and were positioned to accurately measure each passage’s contribution as part of the International Nusantara Stratification and Transport (INSTANT) program. Flow in through Makassar (11.6 Sv, 1 Sv = 106 m³/s) and Lifamatola (1.1 Sv) sums to 12.7 Sv. Total outflow transport corresponds to 15.0 Sv (varying from 10.7 to 18.7 Sv) and is made up of Lombok (2.6 Sv), Ombai (4.9 Sv) and Timor (7.5 Sv) contributions. Heat Transport of the Indonesian Throughflow is 1.087 PW (1 PW=1015 Watt). Circulation and transport within the Indonesian Seas varies along with large-scale monsoon flow. During June to August, southeasterlies of the southwest monsoon predominate over Indonesia and drive strong Ekman divergence (southwestward flow in the Southern Hemisphere thus increasing ITF to 15 Sv) whereas from December to February, Northwest Monsoon westerlies serve to directly reduce the ITF . During monsoon transitions, strong westerly winds in the eastern Indian Ocean force equatorial downwelling Kelvin waves (eastward moving, eastward flow) that propagate through the Indonesian passages as coastally trapped Kelvin waves and serve to reduce the ITF flow with a minimum in April of 9 Sv. Another way to think about it is that downwelling on the Indian Ocean side increases sea level and so reduces the normal Pacific-to-Indian pressure head reducing the flow. Global-scale, ocean waves such as equatorial/coastal Kelvin and Rossby waves drive interannual variation of the ITF with an amplitude of roughly +/-3 Sv. Western-central Pacific westerly winds from El Nino force westward moving-equatorial Rossby waves and eastward currents that hit eastern New Guinea and propagate around the west coast as coastal Kelvin waves and down through the ITF along the west Australia Shelf coast serving to reduce the ITF. Upwelling (i.e. reduced sea level) associated with Rossby waves on the Pacific side reduces the Pacific-to-Indian pressure gradient and reduces the ITF. Interannual variability of Indian Ocean westerlies act in the same manner as the seasonal equatorial Kelvin waves to reduce the normal westward ITF flow as well. An important feature of the Indonesian Throughflow is that because the water in the western equatorial Pacific Ocean has a higher temperature and lower salinity than the water in the Indian Ocean, the Throughflow transports large amounts of relatively warm and fresh water to the Indian Ocean. When the Indonesian Throughflow (through Lombok Strait, Ombai and the Timor Passages) enters the Indian Ocean it is advected towards Africa within the Indian South Equatorial Current. There it eventually exits the Indian Ocean with the Agulhas Current around South Africa into the Atlantic Ocean. So the Indonesian Throughflow transports a significant amount of Pacific Ocean heat into the southwest Indian Ocean, which is approximately 10,000 km (6,200 mi) away from the Lombok Strait. ↑ Sprintall, J., S.E. 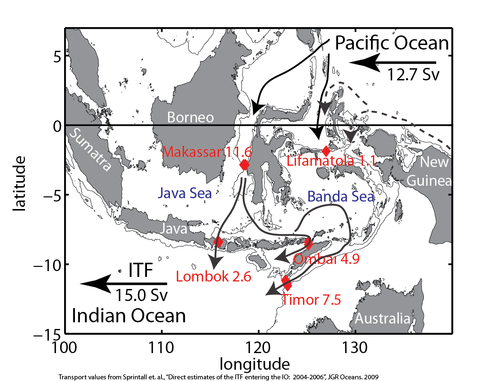 Wijffels, R. Molcard, and I. Jaya, Direct estimates of the Indonesian Throughflow entering the Indian Ocean: 2004-2006, Journal of Geophysical Research-Oceans, 114, 19, 2009. ↑ “Heat transport through Indonesian throughflow by Vivek Kumar Pandey and Avinash Chand Pandey in J. Ind. Geophys. Union ( October 2006 ) Vol.10, No.4, pp.273-277”. (PDF) ITF heat transport result from POM Model. ↑ Schiller, A., S.E. Wijffels, J. Sprintall, R. Molcard, and P.R. Oke, Pathways of intraseasonal variability in the Indonesian Throughflow region, Dynamics of Atmospheres and Oceans, 50 (2), 174-200, 2010. The Indonesian Throughflow at whoi.edu.